The National Association of Colleges and Employers (NACE) publishes a salary survey on an ongoing basis using actual starting salaries for new college graduates as reported by employers from throughout the country. The majority of these students find their job and internship opportunities through SDSU Career Services. See more salary survey results. 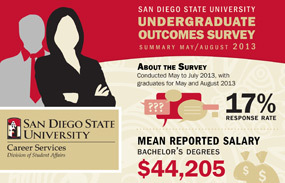 See the May/August 2013 Graduates Outcomes Survey Summary (PDF).